Friday afternoon, we stopped for a shopping break in the town of Hazyview on our way to Blyde River Canyon. The popular Panorama Route through the canyon features several impressive viewpoints, and what could be more impressive than one called God's Window? We arrived there in the late afternoon after a long and winding drive through mountainous terrain. From the viewpoint, a vast and majestic landscape spread out into the hazy distance. Bright red flowers embellished the sheer rock walls of the cliffs on either side of us. The valley below was flanked by gently curving mountains rising to pink-tinged tips illuminated by the setting sun. We climbed a pathway from the viewpoint and arrived in small patch of rainforest that was a lush collage of dense ferns, tangled vines, and crimson flowers. We had a late start leaving Kruger, so we would have to return to the other viewpoints the next day. After sunset, we sped for what seemed like a never-ending two and a half hours along dark, curving roads down from the mountains. At eight o'clock, we finally arrived at Ilkley Game Ranch, where we stayed in the bungalows – with comfortable beds and nice showers! Dinner was provided at the ranch in the form of a traditional dance performance by members of a local Shangaan tribe. These dancers showed amazing endurance as they danced for almost two solid hours while we enjoyed dinner. As an appetizer, we had beef biltong, and this was much nicer than the shrink-wrapped biltong bought in stores. It was more akin to Italian carpaccio. Next, we tried a traditional Shangaan starter. A bucket of chicken heads and feet was passed around; I reached into the bucket and pulled out a chicken foot. I cautiously bit into it, but the meat was almost non-existent, and the claws and bones of course were inedible, at least to me. For the main course, we enjoyed some of the South African dishes we had become accustomed to eating: pap (maize meal porridge) and boerewors (sausage). Saturday was the last day of the trip and was an extremely long day. In the morning, we drove to the nearby Moholoholo Wildlife Rehabilitation Centre, where we listened to an inspiring talk by one of the guides about the true issues of wildlife conservation. He described how international efforts to "save the elephants" or "save the rhinos" unintentionally cause harm to many lesser-known species. The habitat is what really needs to be saved. Although everyone loves elephants, he explained, the large creatures are also destructive, and too many of them in a confined area destroy the habitat of smaller animals, leading those creatures to become endangered. Conservation groups have protested against culling elephants and other star animals, and as a result, the ecosystems in some parks such as Kruger have become unbalanced. Although leopards are difficult to spot, they are abundant in Kruger. The solitary cats are fiercely territorial, and as more leopards are born, there is less land for each cat to claim for its territory. 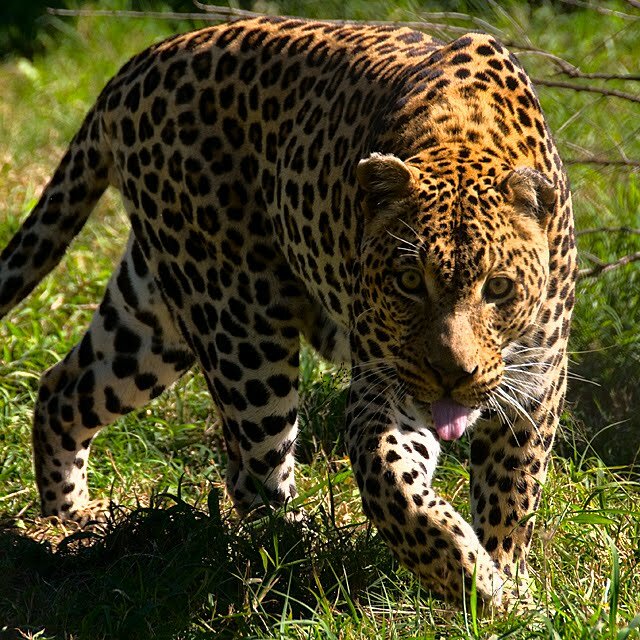 Some leopards therefore leave Kruger and invade local farmland, where they are shot by farmers because the predators represent a direct threat to their livestock and livelihood. The "circle of life" in Africa can never recover on its own. As we humans have encroached on the habitats of wild animals and set up game reserves to protect them, we must attempt to maintain the balance ourselves within these parks, even if this means culling hundreds of one species to save another. After the interesting and eye-opening talk, we toured some of the animals kept in the park. These are mostly wild animals who have been trapped, injured, poisoned, or electrocuted in power lines. 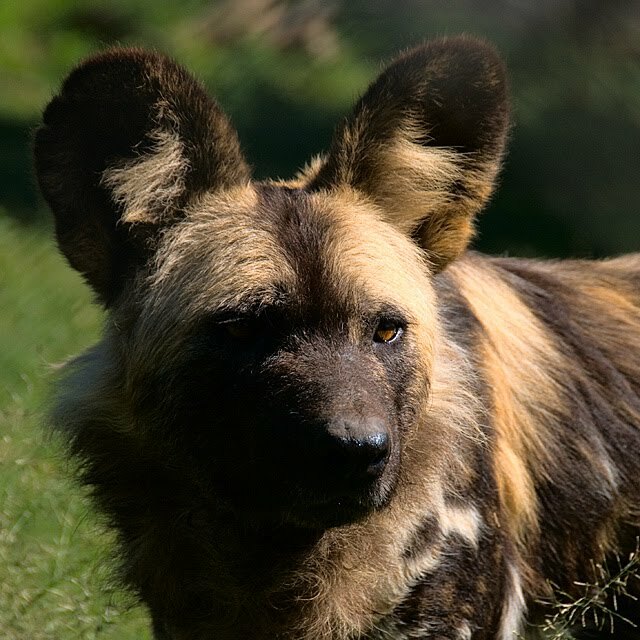 Moholoholo rehabilitates some of these animals and releases them back into the wild. But the center also keeps some of the injured animals to use as educational tools to spread the word about issues facing wild animals in Africa. We were able to pet one of the park's cheetahs, hold some of the birds of prey, see some extremely rare wild dogs, and watch the guide hand-feed – through a chain-link fence – a massive lion and a stunningly beautiful leopard. 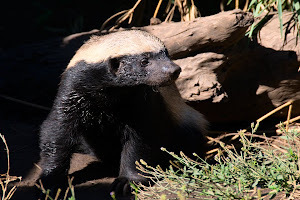 We also visited an enclosure containing honey badgers, possibly the most vicious creatures in Africa. 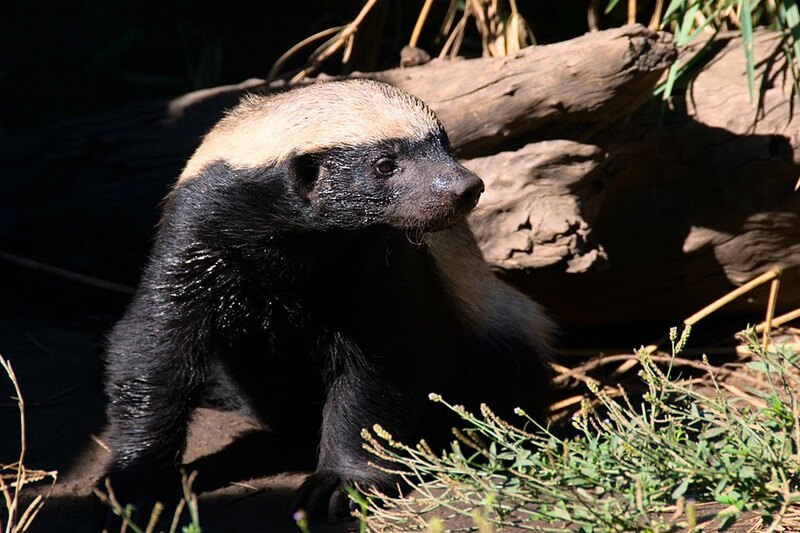 These badgers attack the genitalia of animals, causing them to bleed to death, and they instill fear even in the king of beasts. The guide told us that the badgers recently escaped, and the center's huge male lion was cowering up on a rock, fearing for its life. From the rehabilitation center, it was an hour and a half back to Blyde River Canyon, where we had been the evening before. This time, we visited two viewpoints. 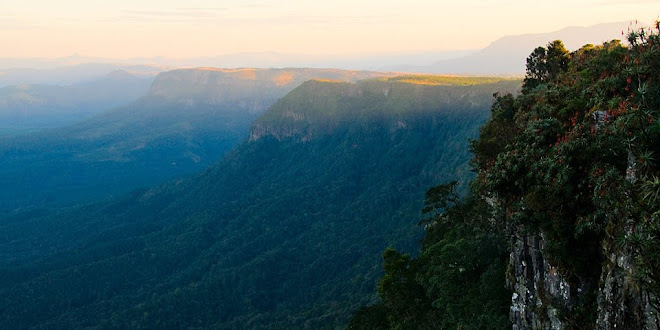 The first is known as the Three Rondavels, and it features an incredible view of a river gorge and some strange round rock formations adorning the crest of the canyon. We ate lunch here and then visited Bourke's Luck Potholes, a series of cascades. 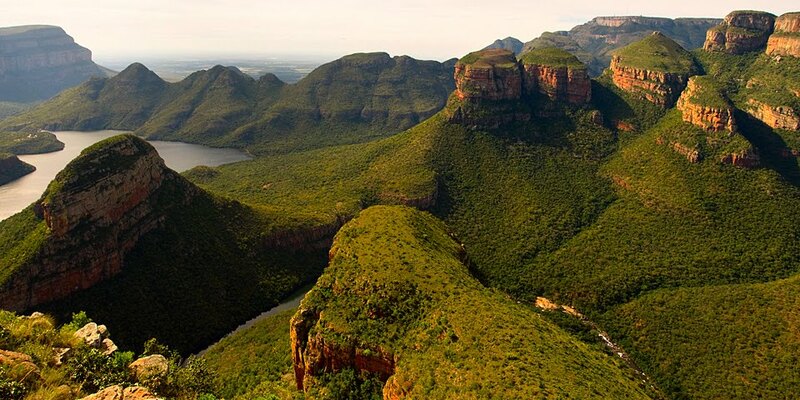 From Blyde River Canyon, it was an agonizing six hours further to Johannesburg, and we arrived about 9 p.m. The truck dropped passengers off at several hotels and the airport, and it was sad saying farewell to so many people in such a short timespan. I stayed on the truck until the last stop, Mufasa Backpackers, where the Nomad crew also stays. Like many people, I have heard the horror stories about the rampant violent crime in Johannesburg, one of the most dangerous cities in the world. Even out in the middle of nowhere, in the suburb of Benoni, there are abundant precautions against robberies. All the houses on the street, including the hostel, look like they were lifted straight out of Baghdad's Green Zone. These fortresses are surrounded by high prison-like walls and iron gates topped by large coils of barbed wire. In addition, angled electric fencing runs along the tops of the walls, and when the gate to the hostel opened to let the truck in, I felt like I was entering Jurassic Park. Yesterday, my last full day in Africa, I toured the infamous urban area of Soweto, the largest township in South Africa. 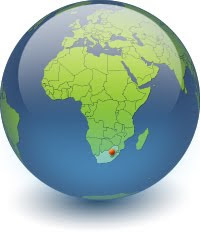 The name refers to South Western Townships, and several million people call Soweto home. It took well over an hour to get halfway across the city, where I met my guide at the Apartheid Museum; from there, it was a short drive into the township. 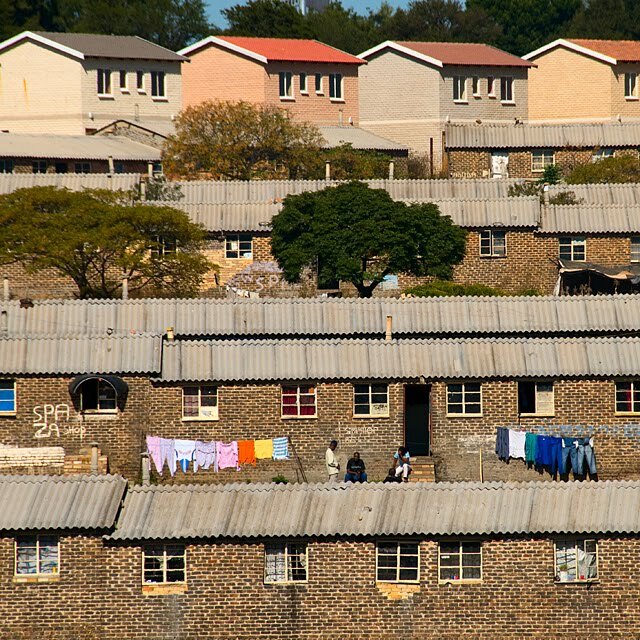 There are actually upper and middle-class sections of Soweto, and the large houses in the richer section look more inviting than the fortresses in the Johannesburg suburbs. 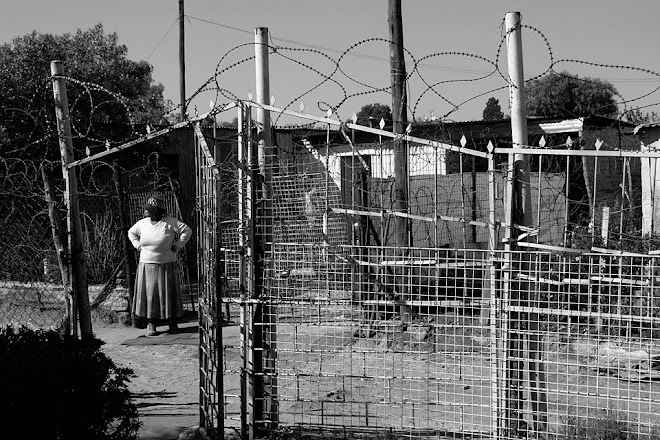 The people of the township live like a family, and crime here is relatively low compared to the rest of Johannesburg. We drove past Desmond Tutu's modest house, as well as the house in which Nelson Mandela lived when he was arrested. 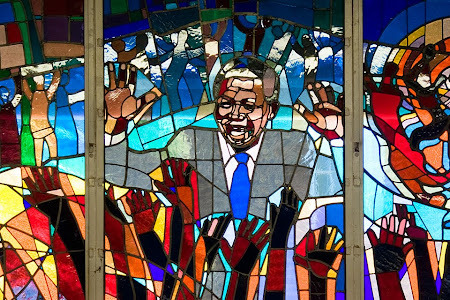 We also visited the Hector Pieterson Museum, which vividly describes the history behind the Soweto Uprising of June 16, 1976 – one of the pivotal events of the apartheid resistance movement. Students, some only elementary school children, marched against the requirement imposed by the apartheid government that Afrikaans replace English as the language of instruction in schools. 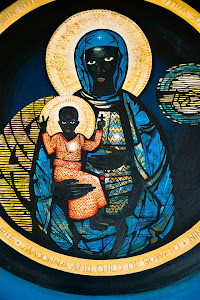 Hector Pieterson was a 12-year-old boy who was killed by a stray bullet shot by over-zealous police; he was only one of over five hundred who died during the riots. The next stop was Regina Mundi Catholic Church, where students sought refuge from unrestrained police during the uprising. Bullet holes can still be seen in the ceiling and the stained glass windows. Our final stop was the informal settlement of Motsoaledi, consisting of a dirt road lined with barbed wire fencing and corrugated metal shacks. Many of the residents in the poorer sections of Soweto do not have electricity, and they use communal toilets and water taps. A woman stands near a barbed wire fence in Motsoaledi in the township of Soweto, Johannesburg, South Africa. After a freezing cold night in the hostel, I walked from Mufasa Backpackers to the nearby post office to ship some souvenirs home, and I left my sleeping bag, blanket, gloves, and other items with the hostel to give to charity. I headed to the airport, leaving Johannesburg and South Africa just as anticipation for the upcoming World Cup reaches fever pitch. On this, my one hundredth day in Africa, I bid farewell to this stunning continent of timeless landscapes, abundant wildlife, and fascinating cultures – indeed, the birthplace of mankind – and look ahead to new adventures in Asia. Africa, you will be deeply missed.